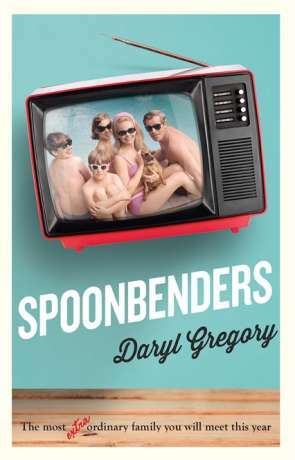 Spoonbenders by Daryl Gregory hasn't even been released at the time of writing and it's already been picked up by Paramount TV. It's the authors first foray into literary speculative fiction and follows the Amazing Telemachus Family. Back in the 1970's they acheived widespread fame for their magic and mind reading talents. Their fame however ended one night on live television as magic seemed to fail them. The story begins twenty years later as teenager Matty, grandson of Teddy Telemachus begins to learn he has strange powers. He realises his family might be a great deal more special than he could imagine. Spoonbenders is all about family, how they work (and don't), how they stick together when they need to. It's also about the sacrifices a parent makes for their children, much of which goes undiscovered. The family of Spoonbenders are just that little bit different though. The father / grandfather is Teddy. Teddy is a conman and trickster but with a good heart. His late wife Maureen used to be able to astral project and worked in a top secret job for the US Government (the Stargate project, a real top secret US project is mentioned). Their daughter Irene helps keep the family together and Teddy on the straight and narrow. Little gets past Irene as her gift is the ability to tell when someone is lying. Son Frankie used to be able to move things with his mind. Then there is their other son Buddy. Buddy doesn't live a linear existence like everyone else. He hops into the future and past, remembering events as he goes. Irenes teenage son Matty is just starting to realise he may have some unusual talents like his grandmother. The story moves between the perspectives of each of these family members while also switching from the past to the relative present of the 1990's. This creates a wonderfully meandering tale which puts much of the emphasis on this unusual family unit. The characters are superb, wonderfully human and with rich personality, the author manages to project each as real as it gets. The stand-out character though has to be Buddy, he is simply an incredible character and the way the author describes his gift is mindblowing. There are some wonderful little touches, not least the skip back in time to the 1990's when computers and the internet were just gaining popularity and you had to live with dial-up speeds, along with the pre-cursor to modern online dating. Moving between the perspectives of each character and also between the 1970's and 1990's is seamless. Not once did I get lost or feel that it interupted the narrative flow. The weaving of these various threads into a cohesive, rewarding story is simply masterful and all comes to a rewarding and thoughtful finale. I loved every minute of Spoonbenders, it's refreshingly different and has a warm, friendly feeling. It's also very clever without appearing to be and the ending is perfectly played out. Anyone and everyone should make room for Spoonbenders in their lives, it's simply magical. Written on 19th June 2017 by Ant.